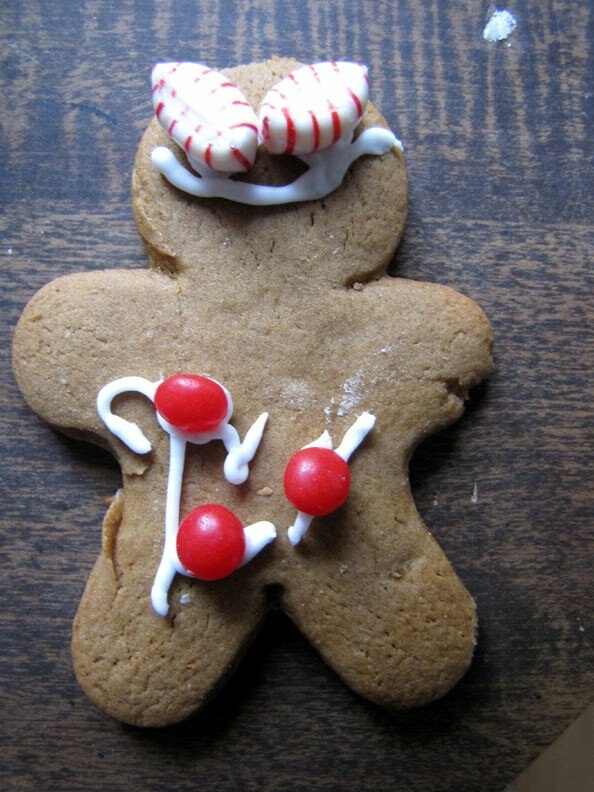 A perfect Gingerbread People recipe! Edible and yummy, but crispy and light enough for hanging on the tree or a garland. This recipe is altered a bit from Simply Recipes. Even though a tablespoon of ginger seems like a lot, it isn't terribly spicy, so if you like more zing in your cookie, by all means add a bit more. I personally don't care for clove much, so I omitted clove - add 1/2 tsp if you like. In a large mixing bowl mix the dry ingredients-- flour, baking soda, salt, and spices. In the mixer cream butter and brown sugar. Add in the egg and molasses, beat it all together. On a low speed, gradually add the dry ingredients, scraping the sides and bottom of the bowl. Divide the dough into thirds, place each on a piece of plastic wrap, and while flattening it a bit, wrap up the dough. Refrigerate them for at least an hour, over night if you like. I placed them outside over the snow for an hour instead. Bring in (or out) one of the dough thirds, and let it sit for five minutes or so at room temperature. If the dough is too sticky and soft, toss and blend in a little flour. If you want to hang them, poke a hole with something small (like a skewer - or pointed end of a paint brush in my case) near the top of the cookie while they're still soft and warm. 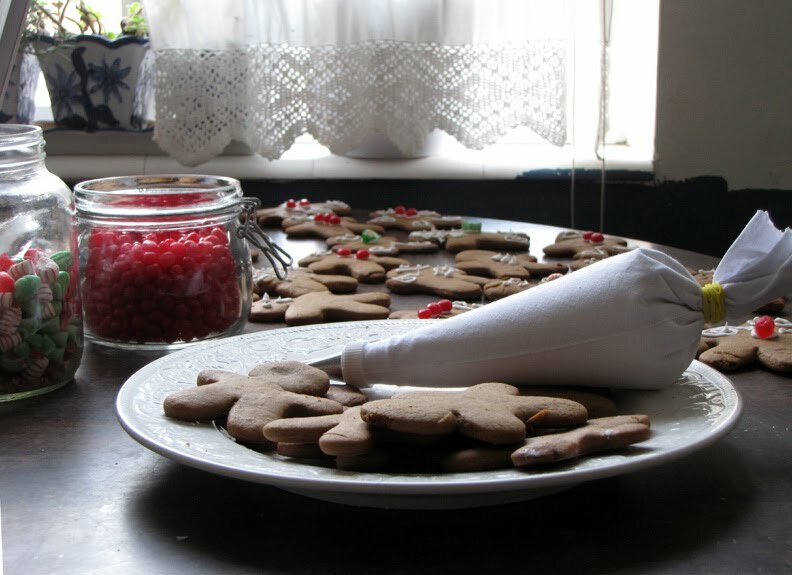 This recipe made for me 3 1/2 dozen cookies. I used the whisk attachment in my mixer to blend the meringue powder, lemon juice, and water. Then I started adding powder sugar until it was the right consistency. I placed a rubber band tightly around the end of the icing bag to help remind children keep the bag twisted closed. ps - there is only about a week left to enter for the beautiful, hand-crafted stilts made by Craftmatter! Put in your name here. We've already done cookies (twice) and five houses so far this week. I swear if I smell icing ever again I'm going to gag. ;P Bwahahahhahhahha~! Any chance you will be reposting your cleaning potions recipes on your blog now that you have merged everything? I love them and sadly did not write them down yet! Shel - Oh, I'm so sorry!! I forgot you asked that a long time ago and I forgot to tell you where they are! There original place is = here, at Happy and Free. I don't remember even having them here, other than I link to them now and again. ?? I bet your home smells wonderful!